Thomas Hurley has been overshadowed in history by his wife, Maisie Hurley, but his dedication to law deserves its own place in BC’s stories. He practised criminal law in Vancouver from 1911 to his death in 1961, aged 77. Thomas Hurley’s first big murder case, as he recalled to a journalist decades later, involved a love triangle on Vancouver’s waterfront. A First World War veteran with the surname Russell lived in a ‘shack.’ The Adams lived close by. Russell and Mrs. Adams began having an affair and her husband found out. A fight between the two men ensued and Adams was stabbed to death. As it turned out, Hurley took on the defense. A key witness testified Adams started the brawl and Hurley was able to convince a jury to acquit his client. Excerpt from “Longevity in the Courts–Thomas Hurley”, published in BC History, Summer 2013. 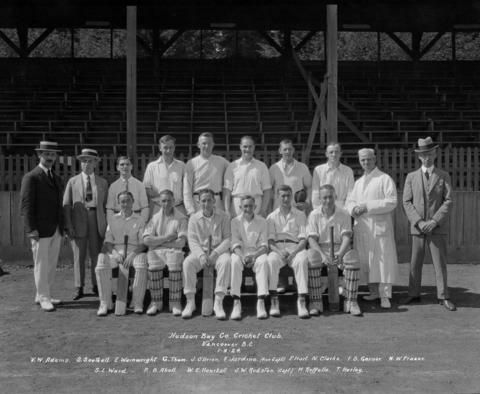 Photo above shows Tom Hurley, front row, seated on the right with Hudson Bay Co. Cricket Club, 1924. Photo credit: City of Vancouver archives, CVA99-3391, Photographer Stuart Thomson. This entry was posted on June 2, 2013 at 5:38 am and is filed under BC History Articles. You can follow any responses to this entry through the RSS 2.0 feed. You can leave a response, or trackback from your own site.